A large and beautiful crop picture at Le Briou (near Crezancy-en-Sancerre) in France on June 2, 2017 shows a schematic diagram of an upcoming solar eclipse on August 21, 2017, including “Baily’s beads” near the eclipsed Sun, and a “crescent” over the nearby star “Regulus”. This crop picture resembles a large “bird” shape in the landscape just below, which seems to be “flying” toward Earth with “L” for “love”. 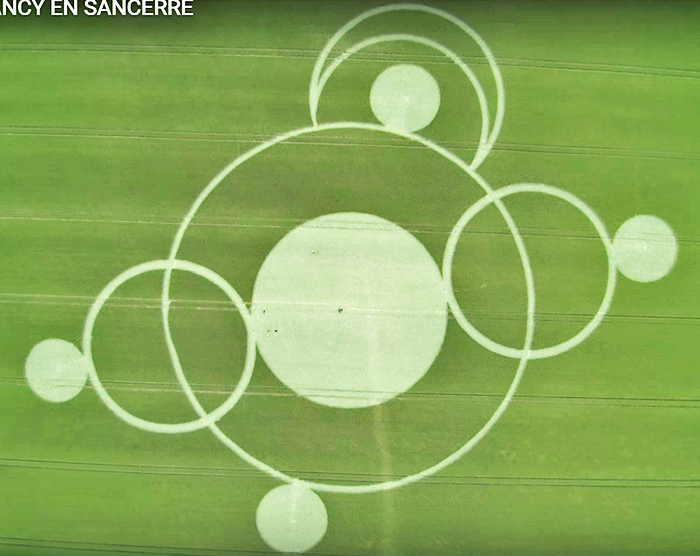 A large and beautiful crop picture appeared mysteriously at Le Briou (near Crezancy-en-Sancerre) in central France on June 2, 2017. Because it could be seen from a busy road nearby (the Route de Bourges or D955), slightly east of the town centre, it attracted many visits from people passing by (see des-crops-circles-sont-apparus-cette-nuit-dans-le-sancerrois). All of its aerial photos (see www.youtube.com or www.youtube.com or www.youtube.com) or ground photos (see Crezancy groundshots or www.youtube.com) appear spectacular. There seems to be little or no possibility that it was made using “rope and boards”. 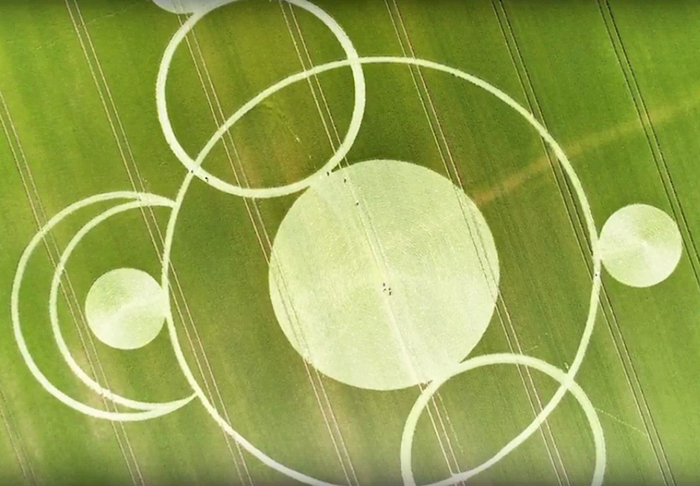 Many green plants within its large, central circle still remain standing on crop tramlines, despite other plants being flattened nearby, as the usual sign of a paranormal crop picture made by unseen energies (see for example woolstone field reports). Might this new crop picture describe an upcoming total solar eclipse on August 21, 2017, in a somewhat artistic fashion? The crop artist seems to be telling us that a “large bird” will be flying our way, toward planet Earth, while a total solar eclipse is in progress on August 21, 2017. Indeed, the overall shape of this crop picture does resemble a “bird”, which might be “flying” from right-to-left with two “outstretched wings”. An unseen crop artist has created a clever, double-metaphor here. Not only does the new crop picture resemble a schematic diagram of the upcoming solar eclipse on August 21, with “Baily’s beads” near a bright star Regulus, but it also resembles a “flying bird” with two “outstretched wings”, and a “lunar crescent” over its “head”, which looks like some kind of “aviator cap” as a pilot might wear. Even that landscape “bird” seems to be wearing an “aviator cap” with “goggles”: please look closely at lower left in the slide above! 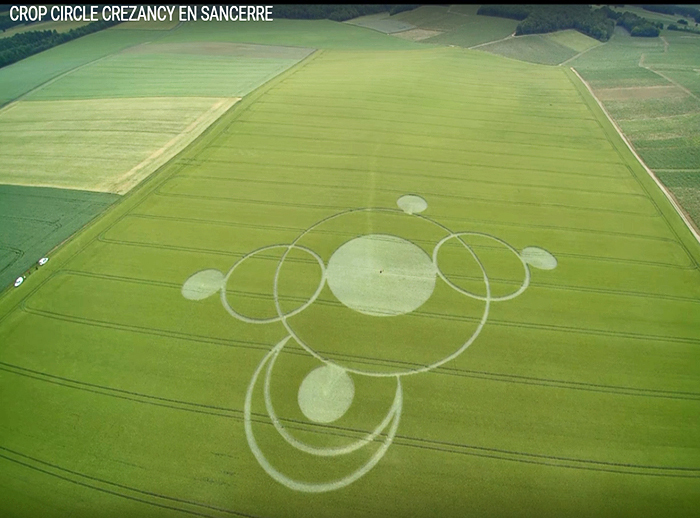 Now we can understand why the crop artist designed his field picture with all of the various shapes as shown, and also why he chose to draw it in crops over the “head” and “neck” of a “flying bird” in the landscape, near Le Birou in France on June 2, 2017. That E.T. “bird” seems to be flying this way with love “L”. Please see a large, landscape letter “L” on the right (in the slide above) within an outlined white box. This is the same kind of landscape symbolism which was used in another “Baily’s bead” crop picture at Fonthill Down in England on May 30, 2017. The letter “L” was seen there along the side of a “descending space shuttle” (see fonthill articles). This “man” seems to be wearing a “blue garment” with a “white cross”, shown enlarged in an outlined white box at lower right. That particular detail of the landscape suggests a famous, French-English crusader known as “Richard the Lionhearted”: please see a small oil painting of his image which has been inset at lower right (see richard_lionheart). Just as the image of a bright star Regulus was drawn in crops with a “crescent crown”, as a “king star” in the constellation “Leo”, so a small landscape image of “Richard the Lionhearted” seems to have been selected as appropriate, for where this crop picture would be drawn. 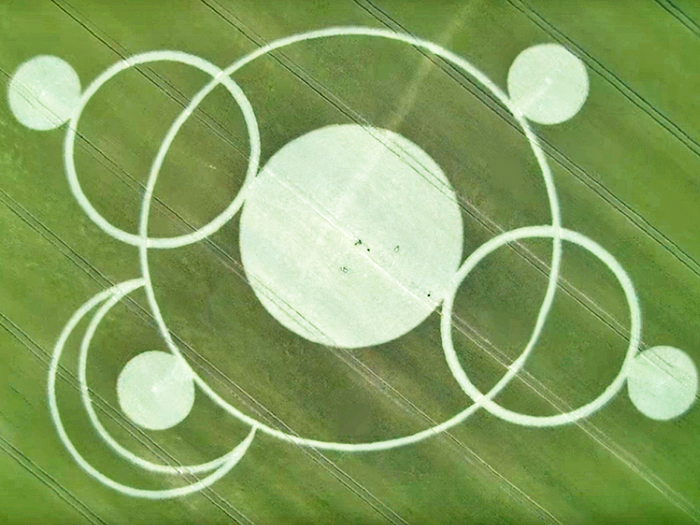 A similar “cross” and “crown” symbolism was drawn in crops near the Milk Hill White Horse in England on May 25, 2017. Again this suggested a “crusader” type of image, as supplied for example by famous paintings of Richard the Lionhearted (seewhitehorse articles). Perhaps their new extra-terrestrial mission to Earth, along with all of these beautiful crop pictures which they have drawn from 1990 to 2017, represents some kind of “crusade”, meaning “going to battle in a faraway land”? P.S. Many thanks to all of the wonderful French people who helped to document this new crop picture near Le Briou, whether by aerial drone or ground photographs, as cited above. PreviousAre ‘Wave X’ And The ‘Event’ The Same? What Will Happen?